Perhaps you expected a green soup? (LOL), I expected to see green too. 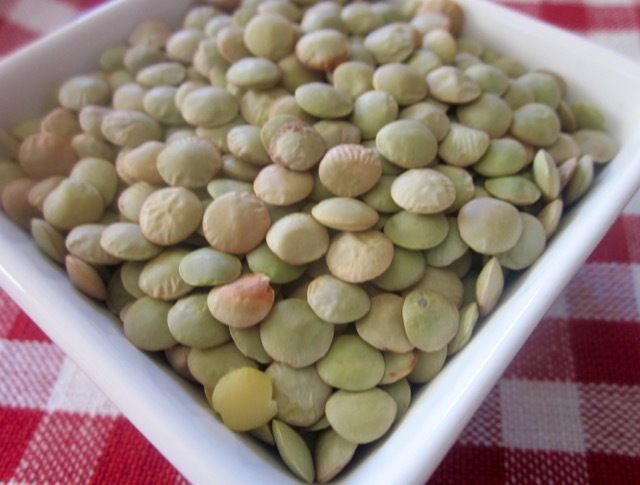 If you love green soups try the mung bean, commonly known as Green Gram or Golden Gram. 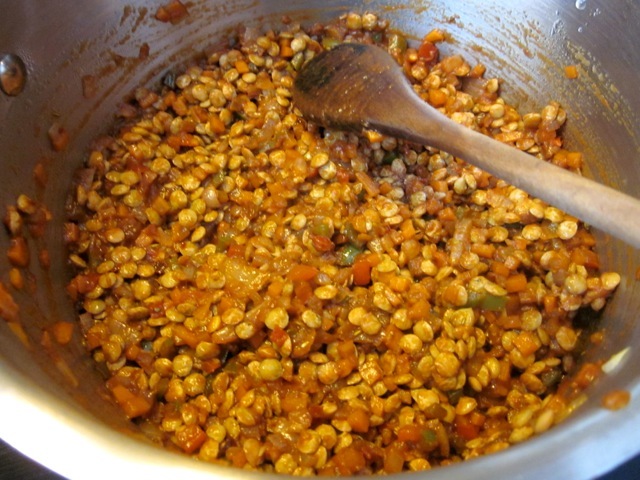 Besides soup, lentils are also used as ingredients in baking. You can mash boiled lentils and use them for scones (biscuits), brownies, cakes, pancakes and even cookies. In fact any recipe that calls for mashed ingredients like potatoes can be substituted with lentils. They can also be used for making burgers in combination with other ingredients like chickpeas, brown rice, quinoa, wheat or even barley. A little while ago I made some Curried Rice and Lentils. It was one of the best meatless meals I ever had. I prefer combining rice with the red lentils because both cook in twelve minutes. The green lentils take about 40 minutes to cook. It depends on whether you want them al dente or completely mushed up. 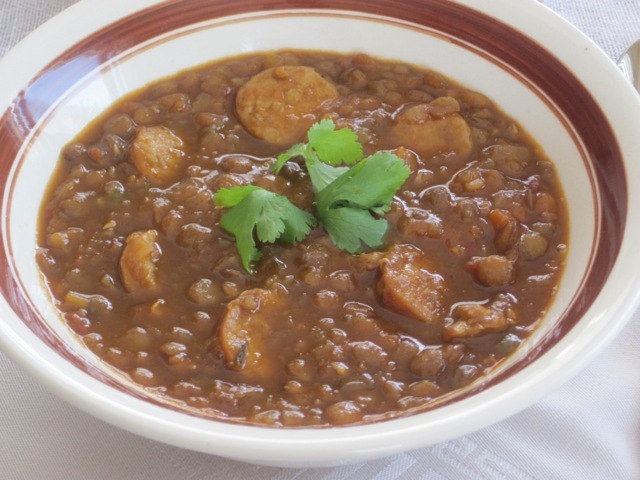 I always serve lentil soup with naan or chapati. I’m afraid I don’t have the best naan making skills, but I’ve promised to give myself a crush course on naan making, one of these fine days. It’s somewhere on my 1km long to-do-list. Okay dear friends I need my 7 hours of sleep tonight or do they recommend 8? Have a good night, good day or good morning. I hope your corner of the world is exciting. Enjoy Friday. Here is what laird lentils look like. They are also called large green lentils. You can use any other green lentil if you don’t find Laird. Heat oil in a heavy based pot over medium heat. 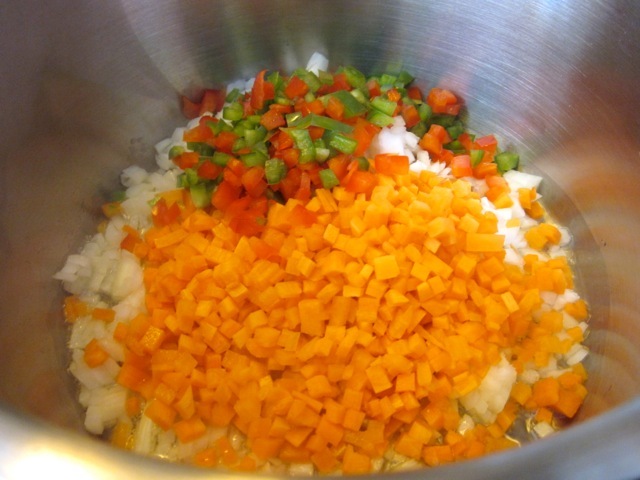 Add onion, carrots, bell peppers and bay leaf and cook for 5 minutes, stirring from time to time. 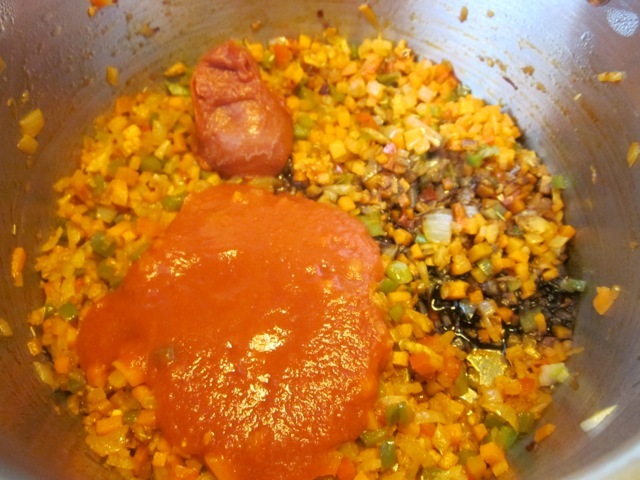 Then add the soy sauce, tomato paste and crushed tomato and stir for another two minutes. then add 4 cups of stock (broth), increase heat, bring to the boil and simmer for 35-40 minutes or until lentils are fully cooked. Add garlic, rosemary, paprika and chilli flakes and cook stirring for 3 minutes, Then add the soy sauce, tomato paste and crushed tomato and stir for another two minutes. 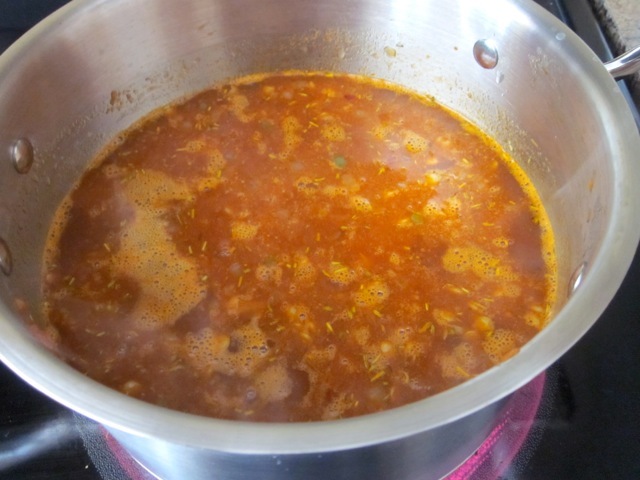 Finally add the lentils and stir until thoroughly mixed then add 4 cups of stock (broth), increase heat, bring to the boil and simmer for 35-40 minutes or until lentils are fully cooked. 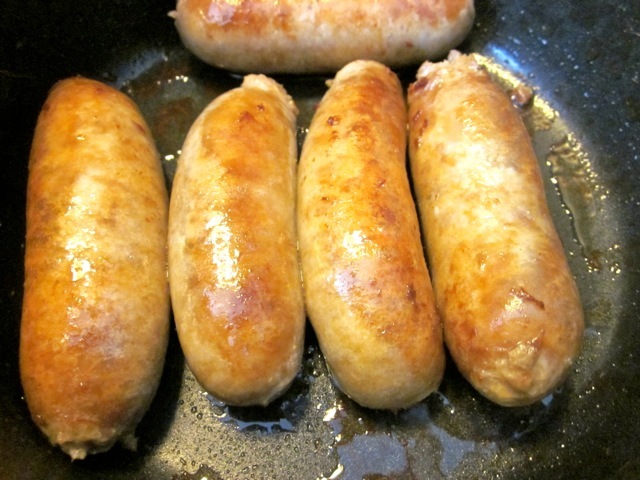 Adjust seasoning at this point, stir in sliced sausages and serve. If the soup is too thick, add more stock. 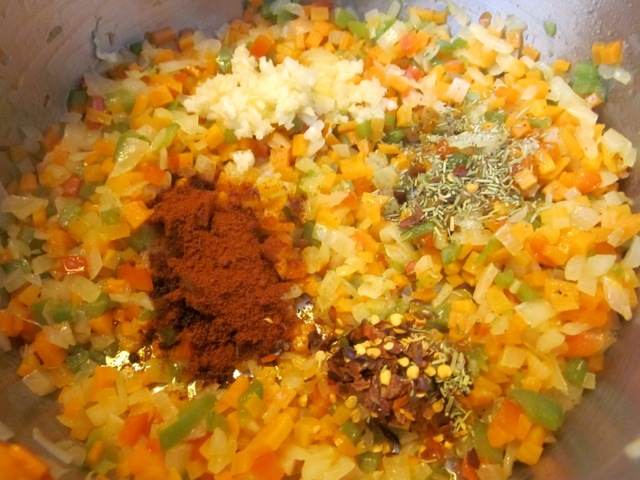 You can also blend 1-2 cups of the soup and pour back into the pot and then add sausages or you can blend the soup smooth, then add the sausages and serve. The served soup can sprinkled with some grated Parmesan cheese, or chopped cilantro or parsley; a dollop of sour cream or whatever please you. Oh this takes me straight back to my childhood! My mother would also add some carrot and potatoes to the soup. Yum! My mother always cooked stew or soup with potatoes. It’s the one ingredient that never missed. if my soup was served without potatoes, I bawled for potatoes….good old days they were! I’m terribly sorry there is one page of messages I totally overlooked and just realized that today. What spices do you use? I’m curious. Perhaps next time I make it I can try your mixture of spices. We have had great weather in the past few days but there is some snow forecasted for next week. Can you imagine that? Thanks, John and enjoy your weekend and hugs to Max. Hi Liz, I love green lentils. They are so filling and healthy and can be cooked in so many ways. I love cooking them with butternut squash or leftover chicken. Thanks for the recipe. Oh yes I have some left over chicken, I even had to freeze it because I had not decided what to do with it! Thanks for the tip. Enjoy Sunday! This looks and sounds delicious. It would go well poured over some rice too I think. Oh yes, Lignum, you can eat it with some rice too. It tastes really nice. This soup of yours looks absolutely scrumptious! 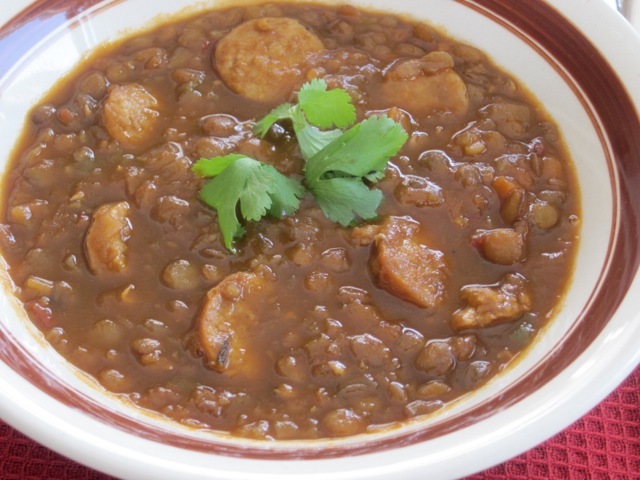 Lentil soup or stew is one of those dishes I always look forward to when its cold. Here in Spain are highly popular, but we usually have them with chorizo (together with salt pork sometimes). This would taste nice with Chorizo too and salted pork. Thanks for complimenting the soup! Well, with 6-10 inches of snow heading our way, this looks like a good choice! If I can just get to a store for the lentils . . .
Omg 6-10 inches. You must be living North of Ontario. We had 20 inches of snow yesterday in the Maritimes. I really felt for them. I don’t envy you. I hope it’s the last bout before spring sneaks back. You”ll probably eat soup next week. Enjoy the weekend and keep warm! Oh yes it goes very well with steamed rice too. It doesn’t sound weird at all! 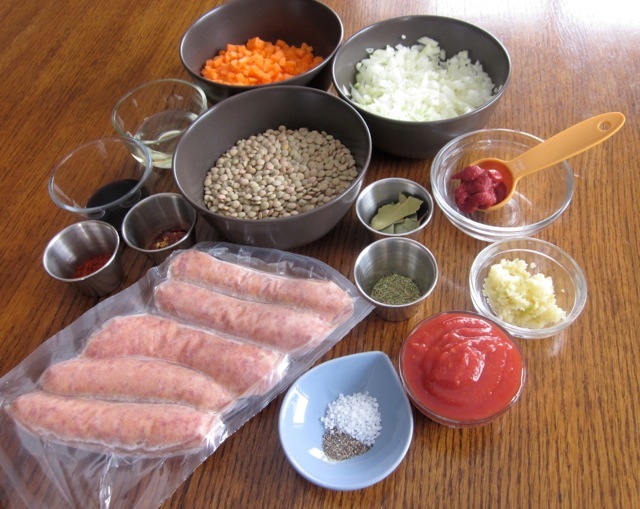 This looks perfectly scrumptious and a great way to sneak some veggies and lentils into my sons’ diet (they will eat just about anything with sausage in it). Thanks for visiting me. You’ve motivated me to aim for 500 posts. Most kids love sausages. Mine do too. Have a lovely weekend! Too funny, I made a very similar soup last week. I didn’t have time to photograph it though, I figure with our weather warming I’ll wait til next fall or winter to blog it. Mine was in the crockpot and I used smoked sausages. I love lentil soup too, it really is a heart and healthy meal. Enjoy your warming weather. It is raining here too so I will have some very energetic boys on my hands! Ha ha we were on the same wave length. I just want to post everything now irrespective of the weather because I know summer will be a busy time for me. 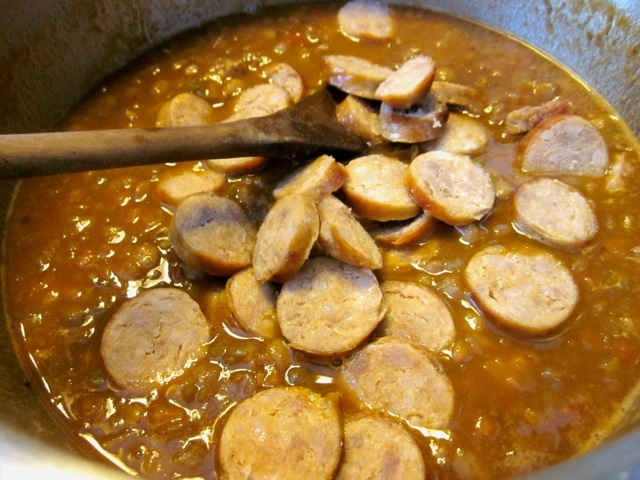 Sometimes I add smoked sausages too. The smokiness gives an even better taste. We have rain today and tomorrow and warm temperatures of 42F. My car is looking a bit clean…he he. Enjoy your weekend. I have to spend today going through messages! Best wishes! 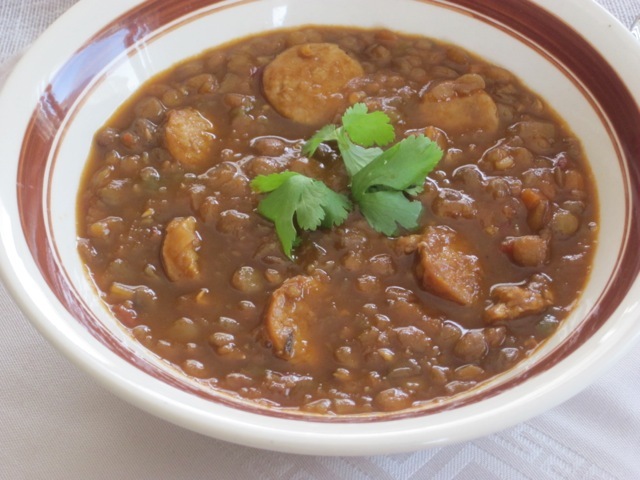 I bet lentils and sausage pair wonderfully together. Both are so hearty – this soup is perfect for our rainy weather! Oh yes, Lisa. I completely agree with you. I enjoyed the soup. Have a wonderful weekend! Hey gal where have you been??? I’ve missed you terribly. It’s great to see you after a long spell of absence. You don’t need to soak split green lentils, they cook in 40 minutes or less. Yes you can have some tonight for dinner. Have a lovely weekend! This is my kind of soup, Liz! You have got me salivating! Yum! Thank you Chef. Have a lovely weekend! Now you’re cookin’, kid! 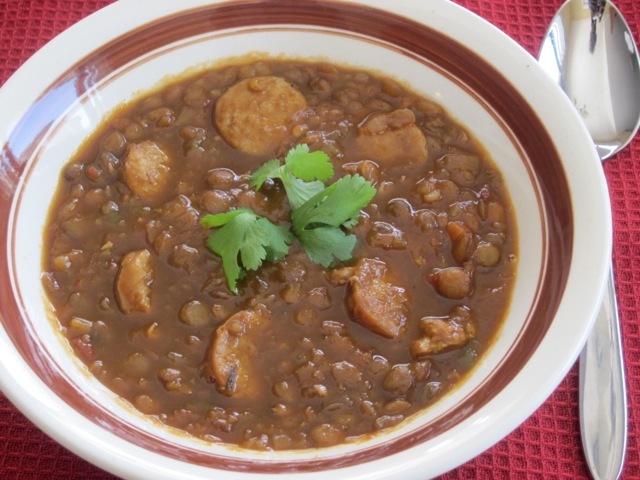 Try some split peas with the leftovers. The different texture adds to it! Wait until you see the smashing bread I made tonight! It’s just a tiny loaf that I was experimenting with. It came out great! I’ve just been to search for the smashing bread. I did eat some Linguine with Basil Pesto. Send me a virtual piece, please! waiting, outside, even though it’s raining…..
It’s raining here too. something close to freezing rain. I love lentil soup! Omg I really envy you. I hope soon, I”ll be tucking in some salad too. I hope you enjoyed your salad. I can’t wait for temperatures to rise a little bit. Keep my fingers crossed. Enjoy Friday, it’s probably Friday by now I guess. I am soon drifting off to dreamland! My weekend was very busy, but I enjoyed it, overall. Have a great week ahead.